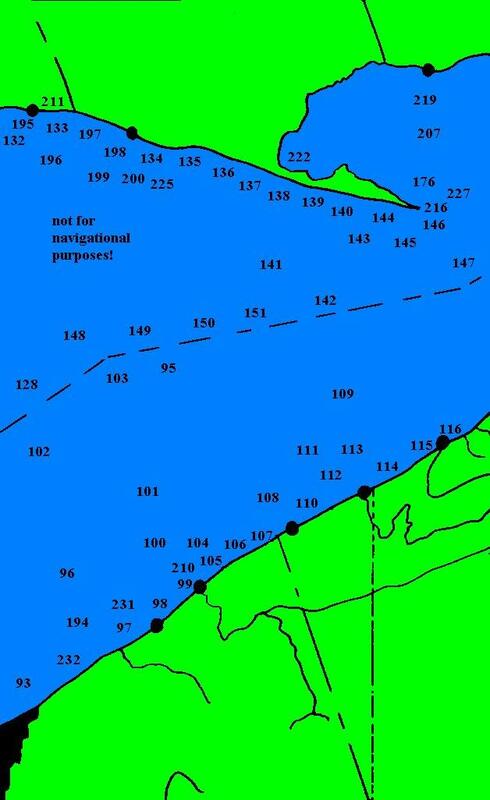 The following is a numerical index to the "C" section of the Lake Erie shipwreck map. For a complete listing of all major shipwrecks on Lake Erie, see the alphabetical index. Please note, this index does not include every accident and collision, nor does it mention the innumerable incidents involving small pleasure boats and private yachts, but rather those disasters which befell commercial vessels resulting in total or near total loss. We have included losses involving boats which were subsequently removed. Wherever possible salvage of the wreck will be noted. The reason for these inclusions is to dispel the many myths which arise concerning lost shipwrecks, where the vessels involved were in fact raised and removed and sometimes repaired and returned to service. Also, it must be noted that many of these wrecks involved vessels running ashore where they broke up. In these cases little if anything of the wreck would survive considering the nature of the weather along these coasts. Any remains on a beach or sandbar would likely be pulverized over time by wave action. Portions of remains in deeper water which protruded from or reached near the surface would eventually be ground off by the action of winter ice flows. Only those vessels which sank in relatively deep water and away from harbors and shipping lanes are likely to remain in place and be somewhat intact. 93 Atlantic: Wooden schooner of 56 ft and 48 tons collided witht he steamer Buffalo on ?/?/1840 and sank 6 miles East of Cleveland. 93 William Grandy: 3 masted schooner barge of 166 ft while being towed along with the Agnes L Potter by the steamer Stewart the Grandy was driven ashore in a gale 8/28/1906 on Euclid Beach, Ohio. The wreck caught fire and burned on September 10th. 93 Zach Chandler: Schooner stranded and broken on 10/?/1887 10 miles East of Cleveland. Subsequently salvaged and rebuilt. The Chandler later sank in a gale on 10/29/1892 in Lake Superior. 95 Killarney: Steel propeller tug of 96 tons sank on 9/12/1974 20 miles off Fairport Harbor, Ohio. 95 Telegraph: Side-wheel steamer of 107 tons collided with the schooner Marquette and sank 2/2/1858 22 miles North of Fairport, Ohio. The NOAA chart gives a location of 42deg 09.54', 81deg 14.77'. We have not verified this and have found the charts to be incorrect in other cases. Any further information would be greatly appreciated. 96 Cleveco: Steel tanker barge of 250 ft sank on 12/2/1942 in a raging blizzard after a heroic but unsuccessful rescue attempt just West of Cleveland, Ohio. Around 04:00 the watch on the Cleveco noticed that the line to the tow vessel the Admiral went downward indicating that the tug had sunk. The Cleveco cut loose and dropped both anchors, but began to drift. Rescue vessels and aircraft were called but could not locate the Cleveco in the blinding snowstorm. After about 12 hours the Cleveco radioed that it was taking water and would soon lose its generators. The radio then went silent. The search continued through the following night at great risk to all involved. The Cleveco sank with the loss of all 18 crewmen on board. At the time the vessel was carrying 1,000,000 gallons of oil from Toledo to Cleveland. In the early 1960s the Cleveco was raised and was being towed toward Fairport Harbor when it encountered a gale and went back to the bottom. In the summer of 1995 the remaining oil was removed from the wreck. It currently lies inverted several miles off Euclid, Ohio. We have confirmed the location of this wreck as being 41deg 47.47', 81deg 36.00'. Please note! The NOAA charts all give an erroneous location for this wreck and are off by over a half mile! The same of course applies to any NOAA derived charts and preprogrammed DGPS type instruments. For further information see the Admiral entry number (B91). 96 Sultan: Wooden 2 masted brig of 267 tons struck bottom in rough weather on 9/24/1864 while leaving Cleveland. When 9 miles out and off Euclid, Ohio, the vessel began leaking badly and sank so quickly that the crew was unable to launch the lifeboat. Seven of the crew of eight drowned. The Sultan carried a cargo of lumber and 200 tons of grindstones. 97 G P Griffith: Wooden passenger steamer of 587 tons burned and ran aground on the night of 6/17/1850 with a great loss of life. This was the second of Lake Erie's three great passenger steamer tragedies and the worst nautical disaster on the lakes until the sinking of the Eastland in Chicago in 1915. The Griffith was carrying 326 immigrants from Buffalo to Chicago on a calm June night and was 5 miles off Willoughby, Ohio when a fire erupted in the hold. This is believed to have been due to the ignition of a shipment of matches included in the cargo. The captain immediately turned the vessel and headed toward land at full speed. While still nearly 1/2 mile out its prow struck a sandbar and the Griffith ground to a stop. The boat burned to the water line and in the ensuing panic only thirty men and one woman reached the beach alive. The remaining hull was eventually dragged ashore, stripped, and later abandoned to the lake. According to Boyer, the Griffith grounded directly offshore from Zophar Warner's farm. We obtained an 1850s map of the site and have determined the approximate point of grounding as being 200 yards off the current beach, North of the intersection of Lakeshore Boulevard and Vine Street. This is a point 2 miles West of the Chagrin River. The remains of the unburned hull and some machinery may be found at 41deg 41.30', 81deg 26.15' in approximately 32 feet of water. 97 S C Walbridge: Wooden 2 mast brig of 105 ft driven ashore and wrecked in a gale on 6/18/1866 15 miles East of Cleveland, Ohio. 98 North Carolina: Tug of 81 ft sank on 12/9/1968 1 1/2 miles off the entrance to Mentor Lagoons harbor in 35 feet of water. This is a popular dive site which is buoyed in June. We have confirmed the location of this wreck as being 41deg 43.80', 81deg 22.88'. 99 Alabama: Wooden schooner of 92 tons collided with the pier at the mouth of the Grand River on 10/17/1843 and was a total loss. The vessel carried a cargo of wheat. 99 Amelia: Schooner supposedly sank on 8/12/1861 in a gale off Fairport Harbor, Ohio with all hands lost. Reports indicate floating rigging and a message in a bottle were found confirming the sinking. This was a hoax and it is now known that the vessel did arrive safely at its destination, though several days late. 99 American Eagle: Wooden 2 masted Schooner of 55 ft and 69 tons was caught in a Southwesterly gale on 11/26/1820 and driven ashore near Fairport, Ohio. Five crewmen died in the wreck. 99 August(a,us) Ford: Wooden 2 masted schooner of 107 ft wrecked by wind driven ice on 4/18/1890 near the entrance to the harbor at Fairport, Ohio. The Ford carried a cargo of lumber. 99 Ben Franklin: Wooden schooner driven ashore in a gale on 11/18/1842 near the mouth of the Grand River at Fairport, Ohio. The Franklin carried a cargo of 50 tons of railroad iron and merchandise. 99 Citizen: Schooner of 116 tons torn loose from the dock and battered to pieces 3/15/1873 in a Spring flood of the Grand River at Fairport, Ohio. The remains of the vessel were later removed as a hazard to navigation. 99 General Houston: Wooden 2 masted schooner of 83 ft and 123 tons while bound for Buffalo on 6/4/1859 attempted to enter the mouth of the Grand river at Fairport, Ohio and broke apart on the pier. The remains of the wreck were washed away in a subsequent storm. The vessel carried a cargo of lumber. 99 H A Lamars: Wooden schooner scow of 88 tons capsized in a squall ?/?/1881 near Fairport, Ohio. The Lamars carried a cargo of wood at the time. 99 John J Hill: Wooden schooner of 91 ft sank 6/22/1885 near the entrance to the harbor at Fairport, Ohio. The Hill carried a cargo of limestone at the time. 99 J S Estabrook: Wooden propeller steamer of 145 ft and 280 tons went out of control while entering Fairport harbor on 10/20/1873 and struck the West pier. The vessel broke in half and was a total loss. The Estabrooks engine was later salvaged. The vessel carried a cargo of lumber, shingles, and wood products. 99 Kate White: Wooden steam propeller tug sank on 8/18/1907 near the entrance to the harbor at Fairport, Ohio. 99 Lady Of The Lake: Wooden steam propeller frieghter suffered a boiler explosion when leaving Fairport Harbor, Ohio on 3/26/1859. The explosion blew off the stern, killing two, and causing the vessel to sink quickly in 17 feet of water. The Lady of The Lake carried a cargo of various food stuffs. 99 L B Johnson: Wooden steam propeller tug sprang a leak in a storm on 5/2/1907 and was abandoned by the crew who spent the night on a small life raft. The vessel later washed ashore and was wrecked. 99 New Lisbon: Wooden 2 masted schooner of 115 ft while bound for Ashtabula, Ohio on 9/10/1871 capsized in a white squall in mid-lake off Fairport, Ohio. The crew was rescued by the steamer Annie Young. The wreck was found by the schooner Jennie P Mack on the 19th and was towed into port. The wreck was abandoned on the 29th. The Lisbon carried a cargo of staves. 99 Ocean: Wooden 2 masted brig of 119 ft sprang a leak and capsized in a storm 10/15/1865 off Fairport, Ohio. The crew held onto the upturned keel until the vessel washed ashore. The Ocean carried a cargo of hoops at the time of the wreck. 99 Pickle Bill's: Floating restaurant dock broke loose in winter ice flows ?/?/1996 while moored at Grand River, Ohio. The barge drifted for two days until located by an air search off Erie, Pennsylvania 90 miles to the East. While being towed back to Fairport, Ohio the vessel encountered a gale and sank. It was later raised and returned to service. 99 R Johnson: Wooden schooner was blown ashore 2 miles West of Fairport, Ohio in a storm on 12/4/1854 and wrecked. This is another of those amazing and tragic coincidences. The crew of nine climbed the masts, but the stricken vessel turned sideways to the bar and rolled repeatedly, dunking the men in the icy water. A farm above where the wreck occurred sent to the nearby town for assistance, but all of the crew died from the cold before help could arrive. It was later realized that the farm on the bluff below which the Johnson had wrecked was the home of the first mate who was in charge of the vessel on that day in the captain's absense. The R Johnson carried a cargo of wheat. 99 Sasco: Wooden schooner of 140 ft driven broadside into the surf in a gale and wrecked 11/17/1879 near Fairport, Ohio. The crew was rescued by the Lifesaving Service using a breeches buoy. 99 Sidney E Smith: Steel bulk freight propeller steamer of 242 ft driven ashore in a storm 11/17/1936 near Fairport, Ohio. The coal cargo was recovered and the vessel scrapped. 99 Sir S L Tilley: Wooden steam propeller freighter of 168 ft caught fire and burned 8/26/1899 7 miles from Fairport, Ohio. The vessel's hull was eventually recovered and rebuilt as the steamer Advance. 99 St Joseph: Wooden propeller steamer of 170 ft stranded and destroyed in a storm on 11/10/1856 near Fairport, Ohio. 99 Thomas Parsons: Wooden 2 masted schooner of 135 ft sank in a storm on 9/28/1891 a few miles off Fairport, Ohio. The vessel was carrying a cargo of iron and coal at the time. 99 William Monteath: Wooden 2 masted brig of 262 tons was driven ashore in a storm on 10/14/1854 and broke apart near Fairport, Ohio. The vessel was carrying a cargo of coal at the time. 100 Ogdensberg or Ogdensburg(h): Wood propeller steamer of 138 ft while downbound on 9/30/1864, collided with the schooner Snow Bird and sank. The passengers and crew were able to safely abandon the vessel with their property and no loss of life. The Ogdensburg is the boat which rammed and sank the Atlantic off Long Point in bad weather in 1852. At the time of the sinking the vessel carried a cargo of wheat and flour. The Wachters give a DGPS location of 41deg 50.418, 81deg 21.964. The remains of this vessel are largely covered by the silt bottom with only portions protruding. The anchor was removed in the 1970s and may now be found in front of Pickle Bill's in Grand River. 100 Queen Of The West: Steam barge of 215 ft sank on 8/20/1903 in rough weather 10 miles Northwest of Fairport Harbor after springing a bad leak. The vessel was involved in an unusual rescue attempt. The captain discovered that running at full speed slowed the leak. The Lifesaving Service therefore removed the crew while both boats were racing side by side. One man died in the transfer. The Queen of the West sank with a cargo of iron ore. It lies in 80 feet of water and is a popular dive site. We shall attempt to buoy this wreck early in the diving season. We were originally given the location of this wreck by the Just Add Water dive shop and have confirmed the coordinates as being 41deg 50.75', 81deg 23.16'. 101 C B Lockwood: Wooden steamer of 293 ft sank on 10/13/1902, 13 1/2 miles North by Northwest of Fairport Harbor, Ohio. The lives of ten of the 19 persons on board were lost in the wreck. Nine including the Captain and his wife were rescued after 12 hours in a small yawl. The larger lifeboat carrying ten crewmen became separated from the yawl and washed up empty on shore days later. At the time, the Lockwood was carrying a cargo of wheat, and according to the Cleveland Plain Dealer of 10/15/1902 additional mixed freight. In a newspaper imterview, the Captain mentioned the vessel sank so rapidly that he was unable to reach his cabin in time to save his large and valuable collection of antique navigational instruments. We began searching for this vessel in 1997 and almost immediately detected it with our magnetometer. However, when we passed over the spot with our sonar, we saw absolutely nothing on the bottom, and figured we were detecting an anchor submerged in the silt. Every few years we returned to the spot with the same result. On June 24th, 2006 when we returned with a better sonar provided by Dave Vanzandt, we discovered a long vertical pipe and a boat davit protruding from the bottom. Members of Cleveland Underwater Explorers Inc recently surveyed the spot with a sub-bottom profiler and verified that the remains of the vessel lie nearly entirely submerged under the silt. Accodring to our log book, the approximate coordinates of the wreck are latitude 41deg 56.48min, longitude 81deg 23.51min. 102 E W Dunham: Wooden 2 masted scow schooner of 76 ft and 75 tons bound from Cleveland for Port Burwell, Ontario encountered a storm on 8/?/1871 and foundered, exact location unknown. The entire crew of 6 were lost. The Dunham carried a cargo of coal. 102 Riverside: Schooner 133 ft sank 10/13/1893 with the loss of the entire crew of seven. The Riverside carried a cargo of limestone. The remains of the vessel were found in 2007 by Cleveland Underwater Explorers Inc in 80 feet of water. 102 Plymouth: Wooden schooner bound from Huron, Ohio to Buffalo, New York on the night of 6/23/1852. The Plymouth collided head on with the sidewheel steamer Northern Indiana and sank within a few minutes. This led to a court decision giving sailing vessels the right of way over steamers. The Plymouth was carrying a cargo of wheat and flour at the time it sank. The remains of a vessel matching the Plymouth were found in 2007(?) by Cleveland Underwater Explorers Inc buried in silt. 103 Osceola: Wooden schooner of 111 ft and 140 tons while passing 20 miles off Fairport, Ohio on 10/2/1851 lost its rigging in a gale. The crew were rescued by the schooner Scotland just before the vessel sank. The Osceola carried a cargo of merchandise.Passenger steamer of 1,106 tons burned ?/?/18?? at Cleveland. 103 Raphael: Barge 643 ton, 107 feet long sank 7/12/1966 due to its load shifting in rough weather approximately 25 miles off Fairport Harbor, Ohio. The Raphael was being towed by the tug Superior out of Great Lakes Towing in Cleveland and carried steel billets worth $500,000 from Republic Steel in Buffalo bound for Ford in Detroit. A search over the following days found no trace of the wreck. We have read and heard conflicting reports pertaining to this incident. Some say the Raphael sank with 26 crewmen lost. The marine reports and newspapers of the time mention no loss of life. This may be due to confusion with the Dean Richmond which sank with the loss of 23 crewmen. It is also sometimes reported that the Raphael carried stainless steel which the records do not indicate. Supposedly the Raphael has been found inverted in 70 feet of water with its stainless steel cargo scattered. This was reported by the same source (Ackerman) which cited that the Raphael carried stainless steel and went down with 26 crewmen. This leads us to believe confusion with the Dean Richmond may be involved since the Dean Richmond was recently found inverted. As to location Swayze claims 25 miles off Fairport, Ackerman claims 26 miles 335degrees off Fairport, while Merchant Vessels claims 23 miles Northwest of Fairport. 104 Andes: Two masted schooner of 130 ft bound from Detroit to Buffalo, sank in a storm 10/24/1868 6 miles North of Madison, Ohio. The vessel carried a cargo of 16,000 bushels of wheat at the time of the wreck. 104 Charter: Wooden propeller steamer of 197 tons swamped and sank in a storm 8/21/1856 6 miles North of Fairport Harbor, Ohio. The vessel carried a cargo of oats and rye at the time of the wreck. 104 Franklin: Schooner sank 10/20/1820 one mile off the mouth of the Grand River at Fairport Harbor, Ohio. 105 Boxer: Wooden schooner of 16 tons sank ?/?/1818 at the mouth of the Grand River at Fairport, Ohio. 105 J J Carroll II: Wooden diesel fish tug of 63 ft struck bottom and sank near shore 10/12/1939 6 miles East of Fairport Harbor, Ohio. 105 L L Lamb: Schooner barge of 126 ft sank 8/16/1902 in rough weather 1 mile North of Fairport Harbor, Ohio with a cargo of stone. 105 N M Standart: Schooner barge of 332 tons sank on 11/18/1880 five miles East of Fairport Harbor, Ohio with a cargo of lumber. The NOAA chart gives a location of 41deg 50.37', 81deg 08.37'. We have not yet verified this and have on other occasions found the charts to be incorrect. 105 Olive Branch: Merchant sloop of 20 tons sank 10/?/1831 at the mouth of the Grand River at Fairport Harbor, Ohio with a cargo of copper ore and whiskey. Wachter gives a location of 41deg 45.41', 81deg 16.35'. 105 Paulina: Wooden schooner driven ashore and pounded to bits in a storm 11/? ?/1818 at the mouth of the Grand River at Fairport, Ohio. 105 Toledo: Wooden 2 masted schooner of 98 ft driven ashore in a storm 11/5/1838 1/2 mile East of the mouth of the Grand River at Fairport, Ohio. The Toledo carried dry goods and was later recovered and rebuilt. 105 unnamed fishing vessel: A new fishing vessel capsized in a storm 1 mile East of Fairport, Ohio on 5/19/1853. Three of the crew of four drowned, and one survived by clinging to the rigging. Wooden schooner blown ashore in a storm 2 miles West of Fairport, Ohio on 11/4/1854 while bound from Chicago to Buffalo. This is another of Lake Erie's strange coincidences. The crew of nine climbed the rigging, but were all drowned in the cold water as the vessel repeatedly rolled in the surf. The farm above the spot where the vessel wrecked was owned by the mate who had been placed in charge of the Johnson on this voyage by his brother the skipper. 105 Wasp: Wooden schooner of 40 ft driven ashore and wrecked in a storm ?/?/1818 near Cunningham Creek, now Madison Township, Ohio. 105 William: Wooden 2 mast schooner of 101 ft was driven ashore and broke apart in a gale on 9/22/1859 at Fairport, Ohio. 106 Charles B Hill: Wooden passenger and package propeller vessel of 252 ft driven ashore and wrecked in a storm on 11/22/1906 near Madison, Ohio. The Hill carried a cargo of coal at the time and was towing the barge Commodore which was released. Mike Wachter has given us a location of 41deg 50.585', 81deg 03.140'. 106 Eliza Caroline: Wooden schooner of 45 ft driven ashore in a storm on ?/?/???? near Madison Point, Ohio. The Caroline was later towed off the beach by the cutter Sherman and sank. 106 Fanny: Wooden sloop of one mast struck by a squall and capsized 5/27/1849 between Fairport and Geneva, Ohio. The Fanny carried 20 passengers. One passenger and the boat's captain drowned. The rest were rescued by the propeller steamer California. The vessel was last seen 8 miles Northeast of the mouth of the Grand River. 106 George H Walker: Wooden 2 mast schooner of 82 ft caught in a storm on 10/27/1853 while bound from Port Burwell, Ontario to Cleveland, Ohio. The Walker sank to its decks well off shore and drifted to a point near the dock at Madison, Ohio where the crew was rescued. The vessel carried a cargo of lumber at the time of the wreck which buoyed and kept it afloat. 106 Philena Mills: Wooden 2 mast schooner of 108 ft ran ashore and broke apart in a storm on 6/20/1866 near Perry, Ohio. Two survivors were rescued by the locals. The vessel carried a cargo of lumber at the time of the wreck. 106 Red Bird: Scow of 39 tons stranded ?/?/1881 5/8 miles off shore 12 miles East of Fairport Harbor, Ohio. 107 C G Breed: Wooden schooner of 385 tons capsized and sank in a sudden squall 11/14/1879 near Ashtabula, Ohio. Five of the crew died in the wreck. The vessel carried a cargo of Wheat at the time it sank. 107 Eli: Wooden schooner sank in a storm on 11/14/1887 near Ashtabula, Ohio. Nine died in the wreck. 107 Frank B Stevens: Wooden bulk freight propeller steamer of 146 ft sank in the harbor at Ashtabula , Ohio on 5/??/1919. 107 James F Joy: Wooden schooner barge of 175 ft sank and broke apart on the beach at Ashtabula, Ohio in a blizzard on 10/24/1887. The crew were rescued from the rigging by the schooner M R Warner. The vessel carried a cargo of iron ore and its hull was later dynamited. The vessel's rudder was found and removed by divers in 1974. 107 Parrott: Wooden 2 masted schooner of 43 ft sank in storm on 5/19/1835 somewhere West of Ashtabula, Ohio. The Parrot carried a cargo of iron, glass, whiskey, and hogs on the deck. The vessel sailed for Detroit on the 19th, and the next day many of the hogs were found swimming to shore. Later, rigging and other gear from the boat washed onto the beach. None of the crew of six were found and are presumed to have gone to the bottom with the boat. 107 Rosa Sonsmith: Wooden 3 mast schooner of 181 ft broke loose in a storm on 11/5/1900 while being towed into the harbor at Ashtabula, Ohio and ran aground 300 ft from the pier. The crew was rescued by the tug Kunkle Brothers. By the next day the vessel had broken apart. The Sonsmith carried a cargo of iron ore at the time. 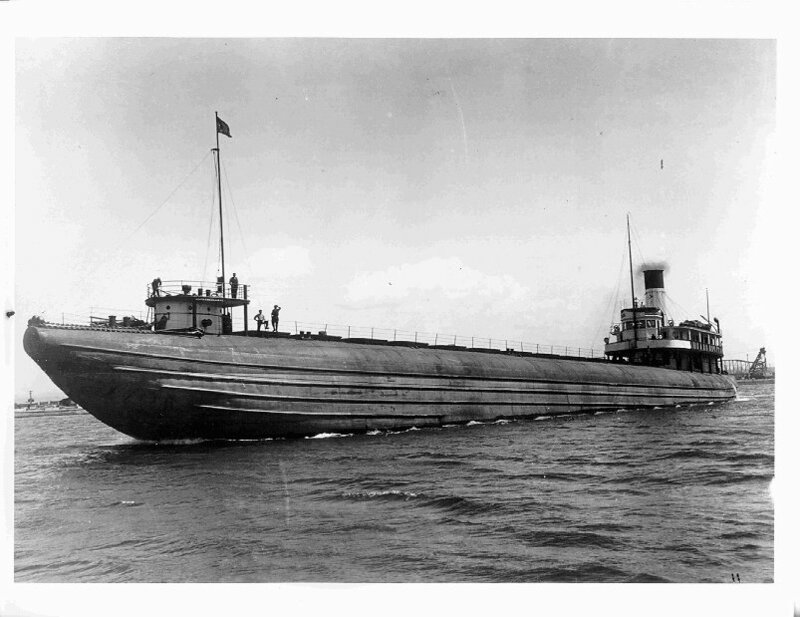 107 R P Reidenbach: Steel tug of 69 ft capsized and sank in the harbor at Ashtabula, Ohio on 10/28/1929. This was likely due to a towing accident. Two of the crew drowned. The vessel was later recovered. 107 Southerner: Side-wheel passenger steamer of 170 ft stranded 10/?/1853 just West of Ashtabula, Ohio. 107 Yukon: Wooden 2 masted schooner freight barge of 270 ft sank in a storm on 10/20/1905 3 miles off Ashtabula, Ohio. The crew was rescued by the tug Thomas Wilson. The wreck was blown up as an obstruction to navigation in July of 1906. 108 Michigan: Wooden barge of 494 tons sank in a storm 10/30/1868 while being towed somewhere between Madison and Conneaut, Ohio. The vessel carried a cargo of lumber and may eventually have been recovered. 108 Pelican: Schooner of 205 ft sank 5/16/1893 in a storm while at anchor off of Ashtabula harbor with a cargo of iron ore. Four crewmen lost their lives in this incident. 109 Ohio: Passenger propeller steamer of 441 tons exploded and sank 11/6/1859 approximately 30 miles South and West of Long Point, Ontario while 10 miles from shore and bound for Cleveland. Our source does not state which shore, but from its heading the vessel would likely be just West of the Ohio Pennsylvania border. Two died in the accident. The other fifteen members of the crew rode a small yawl in rough water throughout the night and until dusk the following day when they were rescued by the steamer Equator. At the time of the wreck the Ohio carried 350 tons of assorted merchandise. This is another of the long sought missing boats of Lake Erie. "Buffalo Commercial Advertizer, 9 Nov 1859 - The Wreck Of The Ohio - Capt. Lee, of the steamer Circassian, who arrived at Detroit from this city Monday afternoon, reported that on Sunday morning twenty-five miles above Long Point, he saw large quantities of flour, whiskey and oil, also portions of a cabin and cabin furniture, beds, men's hats, and two yawl boats. The wind was blowing high and the sea was very rough, and he was running up free before the gale, and too far past before he noticed the articles above named, so that although he tacked and endeavored to lower a boat, he was unable to do so on account of the state of the winds and waves. He says he saw the top of a mast sticking out of the water, and supposed that a North Shore propeller had been lost. This was without doubt the wreck of the ill-fated propeller Ohio, which exploded her boiler in that vicinity Sunday morning." The following is a detailed newspaper report of the accident provided by Brendon Baillod. "Daily News, (Kingston), 8 Nov 1859 p.2 -prop Ohio blows up and sinks off Long Point, Lake Erie; 2 drown, 15 get in yawl without oars, float for 15 hours, picked up by prop Equator. [Summary] Loss of the Propeller Ohio - THE Sandusky Register furnishes the following account of the explosion of the boilers of the propeller Ohio, belonging to the American Transportation Company, and the almost miraculous escape of fifteen of the seventeen persons on board, derived from the first officer of the propeller, Capt. Nickerson, of Buffalo. The Ohio left Buffalo on Friday morning [November 4, 1859], at ten o'clock, bound for Cleveland, with a cargo of 350 tons merchandise. She put into Gravelly Bay and lay till Saturday 5 P. M., when she pursued her course towards Cleveland. At 11 P.M. she was abreast Long Point, weather good. At about a quarter of two o'clock, Sunday morning, Captain Nickerson went below to the engine room, and found about 65 pounds head of steam. At that time he calculated the propeller was 30 miles above Long Point and about 10 miles from land. She carried her foresail jib, and was making about 11 miles per hour. The captain then went to his room, and removing his coat, hat, and boots, lay down on the outside of his bed to rest. He had lain there about 10 minutes, awake, when he was startled by a crashing report, like the explosion of heavy ordnance. He sprang from his bed, and without stopping to put on the clothing he had removed, hastened upon deck. An awful scene met his view. There was nothing of the propeller above water but the hurricane deck and bows, and all around the struggling crew were clinging to the pieces of the wreck and crying plaintively for help. Luckily one of the yawls struck in the water right side up, into which the Captain had just time to step and push off before the wreck went down. He was the last to leave the propeller. The other yawl was capsized. There were seventeen persons on board, all told. Of these, fifteen were saved. The other two, Thos. Corvett, the second mate, and Michael Danigan, wheelsman are missing. The former was seen running aft after the explosion occurred, It is thought he got tangled in the wreck and went down. The wheelsman was not seen after the accident. The Captain's son, a lad of about fourteen years of age, was on board and was saved with difficulty. He had but just recovered from an attack of fever, and was weak and consequently but illy able to take care of himself. He was caught under the cabin as it toppled over, and would have been drowned had not the engineer reached under the wreck and pulled him out. Into the single yawl the fifteen survivors huddled, and having nothing for oars but pieces of the wreck, they were almost entirely at the mercy of wind and waves. They drifted up the lake, and saw two vessels before daylight bound down, which passed not over 10 yards from the yawl. All efforts to attract the attention of those aboard the vessels were in vain. A propeller and sail vessel were seen during the day, but they veered off towards land and soon passed out of sight. The condition of the ship-wrecked men now became desperate. They were scantily clad, not one of them having either hat or shoes, a cold north-east gale was blowing and the seas were rolling terrifically. Many of the poor fellows, considering their case hopeless, abandoned themselves to despair. But their brave Captain, undaunted, and working with the energy of several men, with words of hope and encouragement, stimulated them to renewed exertion, and all labored with their impromptu oars to keep their frail bark from swamping. Darkness now began to gather upon the horizon, and the stoutest hearted of the devoted little crew began to give way before the almost certain prospect of a watery grave which stared them in the face. But a propeller is seen in the distance bearing towards them. It nears them, their signal of distress is seen, and they are picked up at about 5 P. M., off Madison Dock, 25 miles below Grand 220 River, and about 15 miles from land. The propeller proved to be the Equator. With the promptness and humanity of true and noble hearted sailors, Captain Hines and his officers and crew did every thing in their power to administer to the comfort of their ship-wrecked brethren. They supplied them with clothing, and recruited their wasted powers with the best refreshments the Equator could afford. For this disinterested and humane kindness, the officers and crew of the Equator have the unfeigned thanks of those whose wants they so promptly relieved. That a common yawl boat, in which were fifteen persons, should ride out the gale of Sunday, seems almost a miracle. Captain Nickerson, who is an old sailor, says he never saw a more terrific sea than that which ran between twelve and two o'clock. He thought every surge would carry them down. When the Equator stopped to pick them up, she rolled so tremendously that it was feared she would go to pieces. The cause of the explosion is unknown. - At the time the accident occurred, the second engineer was engaged in oiling the machinery, and the firemen in trying the water, which he found all right. The Ohio is estimated to have been worth about $15,000. It was not insured. The cargo was very valuable, and was probably mostly insured. Captain Nickerson lost $30 in money, two valuable glasses, a barometer, and about $250 worth of clothing." 110 Ashtabula: Steel steam carferry of 338 ft collided with the steamer Ben Moreell and sank 9/18/1958 in shallow water just offshore of Ashtabula, Ohio. The vessel was later removed for scrap. 110 Dixie: Barge sank 12/4/1964 4 miles off Ashtabula, Ohio. 110 Dundurn: Barge of 232 ft sank 7/15/1919 in a storm while being towed by the tug Home Rule just outside of the harbor at Ashtabula, Ohio. Two crewmen died in the wreck. 110 E S Catlin: Schooner barge of 372 tons stranded and broken ?/?/1876 5 miles East of Ashtabula, Ohio. 110 Nevada: Wooden schooner of 136 ft sank on 10/10/1886 five miles East of Ashtabula harbor in a storm after losing its sails and being driven ashore. The Nevada carried a cargo of coal at the time of the wreck. 110 Surveyor: Launch sank ?/?/1965 at Ashtabula, Ohio. 110 Wonder: Wooden propeller tug of 95 ft stranded and wrecked in a storm 7/13/1908 in the harbor at Ashtabula, Ohio. 111 Eli Bates: Schooner of 265 tons sank 11/?/1871 7 miles North of Ashtabula, Ohio. Nine crewmen died in this incident. 112 J C Daun: Wooden schooner capsized and sank in a storm ?/?/1847 off Conneaut, Ohio. Eight persons lost their lives in the wreck. 112 Keepsake: Schooner of 133 ft sank on 9/17/1898 in a storm approximately 6 miles North of Ashtabula, Ohio with the loss of all hands. 112 Morning Star: Wooden schooner of 49 ft capsized in a storm and sank ?/?/18(44 or 49) off Conneaut, Ohio. 112 Sandusky: Wooden propeller steamer of 139 ft caught fire and burned to a total loss on 10/?/1857 near Conneaut, Ohio. 112 Shenango #1: Wooden propeller car ferry of 283 ft became trapped in ice in January off Conneaut, Ohio. The Shenango kept its fires burning until the ice began to break. Then on 3/11/1904 the vessel caught fire and burned to a total loss. One member of the crew died in the fire. The Shenango carried a cargo of railroad cars at the time. 113 Carole Sue II: Wooden Trawler of 63 ft restored and converted to a pleasure boat sank 10/11/99 in 6 foot waves while 6 miles off Conneaut, Ohio. The Carole Sue was motoring along when suddenly it began to sink, going under by the stern after only four minutes. The crew of three struggled uphill through the waves to the bow and later clung to the pilothouse which broke loose when the vessel went under. After an hour, the crew were rescued by the Coast Guard out of Erie. The vessel valued at $65,000 currently rests upright in 70 feet of water. 113 Genevieve Ryan: Wooden barge of 418 tons sank on 10/? ?/1936 between Erie, Pennsylvania and Ashtabula, Ohio. 113 John B Lyon: Wooden freight steamer of 250 ft sank on 9/11/1900 while running for shore in a terrific storm 6 miles Northwest of Conneaut, Ohio. Eleven of the crew died and five survived. As the Lyon went down Captain Singhas gave his life vest to a wheelsman who could not find one. The captain then lashed his wife and the wife of the Steward to a broken spar. They were joined in the water by the Lyon's two wheelsmen. One survivor, the second engineer washed ashore unconscious, while the two women and wheelsmen were found tied to the mast by rescuers after fifteen hours in the water. Wachter gives a Loran location of 44222.4, 58212.0. 114 Benjamin Barton: Wooden schooner of 87 ft blown ashore and wrecked in a storm on 11/5/1838 just East of Conneaut, Ohio. The Barton was repaired the following Spring. 114 Chesapeake: Side-wheel passenger steamer of 172 ft sank 6/9/1847 after a collision with the schooner John F Porter 3 miles North of Conneaut, Ohio. A number of lives were lost in this incident. For further information see the John F Porter entry number 114 below. 114 Convoy: Wooden 2 mast schooner of 102 ft sank in a storm in the Autumn of 1854, 13 miles off Conneaut, Ohio. The entire crew of 8 died in the wreck. The following July the vessel was marked for raising by a salvager named William Pike, but no further information is available in this regard. 114 Crooked Creek Artifact: This consists of wood planking approximately 40' long and 10' wide and may be decking from the Ohio, Chesapeake, John F Porter, or F.A. Georger. It was discovered recently by Bob Carlberg in about 15 feet of water and about 50 to 60 yards offshore, 200 yards East of the mouth of Crooked Creek in a small cove. Crooked Creek is on the Pennsylvania side of the Ohio/Pennsylvania border. We have no further information. 114 Fleetwing: Wooden ferry of 60 tons burned and sank ?/?/1920 in the harbor at Conneaut, Ohio. 114 Indiana: Wooden steam freighter of 434 tons struck an obstruction, stranded and burned to a total loss on 12/5/1848 off Conneaut, Ohio. The Niagara Divers Association's web site lists a position of 42deg 17.819', 79deg 59.907'. 114 John Porter: Schooner of 306 tons sank on 6/9/1847 while running for shore after ramming the steamer Chesapeake off Conneaut, Ohio. The vessel sank just off the beach and was likely recovered. For more information see the Chesapeake entry number 114 above. 114 Oakland: Wooden package freight propeller steamer of 184 ft sank in a storm 9/17/1883 off Conneaut, Ohio. The entire crew of eleven survived. However, four were rescued from a makeshift raft 30 hours later. The vessel carried a cargo of lumber at the time of the wreck. 115 F A Georger: Schooner barge of 200 ft sank 11/11/1940 in a severe storm while being towed by the John B Lyon 4 miles East of Girard, Pennsylvania. 115 McConnell: Wooden scow of 138 tons sank 11/24/1898 in the harbor entrance at Erie, Pennsylvania. 116 C F Mischler: Wooden steam propeller tug of 51 ft destroyed by fire on 10/28/1915 at Erie, Pennsylvania. 116 Charles A Trinter: Wooden gas powered screw packet boat of 35 ft caught fire on 1/6/1916 off Erie, Pennsylvania and sank. 116 Charles Foster: Wooden 3 mast schooner bulk freight barge of 227 ft sank on ?/?/?? in a gale while being towed by the Iron Duke. The vessel went down 9 miles off Erie, Pennsylvania 82 degrees West of the Presque Isle light. The Foster carried iron ore. It's mast was still visible above water in 1901. 116 Charles Reed: Wooden steam propeller tug of 68 ft burned in 1922 at Erie, Pennsylvania. 116 David Foster: Wooden freight barge of 447 tons sank on 11/9/1936 18 miles off Erie, Pennsylvania. One life was lost in this wreck. 116 E C Williams: Wooden schooner of 105 ft dropped anchors in a storm on 5/26/1861. The anchor lines parted and the vessel was driven ashore and broken to pieces 4 miles East of Erie, Pennsylvania. When the vessel struck it heeled over and the crew was able to walk the masts to shore. 116 George M Mowbray: Wooden schooner of 40 tons caught in a snow storm and gale on 11/10/1880 and sank a few miles off Presque Isle, Pennsylvania. At the time of the wreck the vessel carried a cargo of 20 tons of nitroglycerine and blasting powder which was later salvaged. 116 Maria F Johnson: Wooden schooner sprang a leak and sank while running for shore on 11/23/1868 off the tip of the peninsula surrounding Misery Bay at Erie, Pennsylvania. The Johnson carried anthracite coal at the time. The wreck was originally reported to have 20 feet of water over its deck. 116 Northumberland: Wooden schooner of 344 tons driven ashore and broken apart in a gale 11/20/1879 just West of Presque Isle, Pennsylvania. The following day the cargo of lumber was found scattered along the shore for a great distance. 116 Oneida: Wooden steam propeller freighter of 200 ft was destroyed by fire on 8/20/1893 off North East Pennsylvania. 116 Philip D Armor: Wooden steam freighter of 264 ft sank on 11/13/1915 after striking a reef 10 miles Southwest of Erie, Pennsylvania and 1 1/2 miles off shore. 116 William Penn: Wooden side-wheel steamer of 214 tons was caught in a storm on 5/28/1836. The vessel stranded and broke apart near Erie, Pennsylvania. 116 Young Lion: Wooden 2 masted schooner of 73 ft sank quickly in high winds when the hull opened at the seams on 7/6/1836 12 miles from Erie, Pennsylvania. The crew of five saved themselves by climbing to the tops of the masts which remained above the water when the vessel foundered. They were later rescued by the schooner New York. The Young Lion carried a cargo of railroad iron and lumber. 128 James B Colgate: Steel whaleback steamer of 302 ft sank on 10/21/1916 in one of the worst storms ever recorded on Lake Erie. The Colgate was transporting a cargo of coal when it rode up a huge wave and dove to the bottom killing twenty five crewmen. The captain was the only survivor. The above two photos give a good idea of the appearance of this type of vessel. From the bow view it is obvious why whalebacks were also called "pig boats". The rounded hull was designed particularly to handle the steep breaking waves sometimes encountered on the relatively shallow lakes. Few such boats ever sank as the result of storms. The Colgate was an exception. The Colgate lies inverted in 85 feet of water. Wachter gives a DGPS location of 42deg 05.38', 81deg 44.28'. 128 Valentine: Schooner of 270 tons sank 10/10/1877 with a cargo of coal. 132 Choctaw: Propeller packet steamer of 75 ft burned 1/?/1923 while docked at Port Stanley, Ontario. 132 Free Trader: Side-wheel passenger steamer of 136 ft burned 12/?/1857 in the harbor at Port Stanley, Ontario. 132 Sweden: Schooner scow of 324 tons blown ashore on 10/8/1877 in a gale and destroyed. The Sweden was carrying a cargo of lumber at the time. 132 Tom Wrong: Wooden schooner or bark of 117 ft wrecked on a reef in a storm 11/20/1866 near Port Burwell, Ontario. 133 C O D: Merchant schooner of 140 ft run ashore on 10/22/1887 3 miles West of Port Burwell, Ontario. One crewman was lost in the wreck. The vessel was carrying a cargo of wheat at the time. 133 Dahlia: Schooner of 210 tons beached ?/?/1857 near Port Burwell, Ontario. 133 Mineral State: Wooden 3 mast schooner of 137 ft driven onto a reef in a storm and wrecked 10/30/1902 just East of Port Stanley, Ontario. Most of the crew was rescued by the tug Gordon Brown. One crewman floated ashore on a hatch cover. The vessel carried a cargo of coal at the time. 133 Silvanus J Macy: Wooden freight steamer of 165 ft sank 11/23/1902 in a gale with the loss of the entire crew of 14 off of Port Burwell, Ontario. The Macy carried a cargo of coal. 134 John Tibbets: Merchant schooner of 114 ft broke up just offshore on 7/11/1888 at Clear Creek, Ontario. 135 City Of Dresden: Freight steamer of 93 ft was driven on the rocks on 11/18/1922 in a gale and broke up. The Dresden was smuggling a load of whiskey at the time and the cargo was rescued. 135 Erie Wave: Merchant schooner of 76 ft driven onto a sandy reef and capsized on either 9/30 or 10/10/1889 near the Houghton Sand Hills, Ontario. Eight of the ten crewmen died in the wreck. 135 Portage: Schooner scow of 224 tons sank near shore in about 25 feet of water in a gale 7/26/1878 8 miles West of Port Rowan, Ontario. The vessel carried a cargo of 400 tons of coal at the time. 136 Eliza R Turner: Schooner of 425 tons sank on 10/10/1877 9 miles West of Long Point, Ontario. Two lives were lost in the wreck. 136 Jessie Anderson: Schooner of 114 ft sank 10/30/1871 near Long Point, Ontario. The entire crew perished in this incident. 136 Mary Jane: Bark of 136 ft blew ashore 11/19/1881 and broke apart on Long Point near Port Rowan, Ontario. The vessel was carrying a cargo of telegraph poles at the time. 136 William G Keith: Wooden schooner of 124 ft driven ashore and wrecked in a gale on 10/31/1870 1/2 mile off Long Point, Ontario. 137 Evergreen City: Wood propeller bulk freighter of 193 ft and 624 gross tons was driven onto the shore of Long Point, Ontario by a Westerly gale where it broke in half. The hull was later recovered and rebuilt. 137 Magnetic: Schooner barge of 264 ft sank after breaking apart on 8/25/1917 in rough weather 19 miles West of Long Point, Ontario. The Magnetic carried a cargo of iron ore.
138 E Fitzgerald: Wooden 2 mast schooner of 135 ft wrecked in a gale in shallow water on 11/14/1883 2 miles West of the old cut light on Long Point, Ontario. The crew attempted to reach shore in the yawl boat, but died in the attempt. 138 Empire: Propeller passenger steamer of 254 ft stranded in a storm 10/26/1870 on Long Point, Ontario and broke up. 138 Majestic: Propeller freighter of 291 ft caught fire and sank on 9/19/1907 12 miles West of Long Point, Ontario. 138 Quickstep or Quick Step: Wooden schooner of 300 tons collided with the schooner Hanson on 11/22/1869, possibly in a storm, The Quickstep then ran aground on Long Point and broke apart. 138 Rebecca Foster: Wooden 2 masted schooner of 75 ft and 89 tons was driven ashore on Long Point, Ontario in a storm on 11/6/1863. The vessel broke apart and was a total loss. Its catgo was lumber. 139 Cataract: Schooner of 138 ft wrecked ?/?/1857 on Long Point, Ontario. 139 Fortune: Schooner or propeller steamer of 110 ft driven ashore by a powerful storm 10/23/1884 and broken apart on Long Point, Ontario. 139 Idaho: Wooden freight steamer of 220 ft sank on 11/5/1897 in a terrific storm 4 miles West of Long Point, Ontario. The vessel was carrying a cargo of Christmas ornaments when it began to open at the seams. The crew fought the rising water in the hold for hours with buckets until the pumps finally gave out and the boiler fires were lost. A large wave raised the bow, the water shifted aft and the Idaho went down by the stern. Nineteen of the twenty one crewmen died. Two crewmen, a deck hand and the second mate, managed to climb the tall forward mast which protruded above the surface when the Idaho settled to the bottom. The two clung to the mast for 12 hours at which time the first mate of the steel freighter Mariposa happened to spot them while passing. After several tries and a crushed lifeboat it was determined that the weather was too rough for a small boat. Captain Root turned the Mariposa in a large circle and after three passes, despite the huge waves, managed to bring the big steamer close enough to the mast for the Mariposa's crew to reach and pry the frozen survivors loose. This has since been remembered as one of the greatest feats of ship handling on the lakes. 139 Miami: Wooden schooner of 137 ft and 248 tons stranded on Long Point, Ontario in a storm on 11/3/1874. During salvage the vessel broke apart in a second storm. The Miami carried a cargo of wheat. 139 Prince Albert: Schooner ran aground and was pounded apart by a storm 10/25/1851 while attempting to enter Long Point Cut. The vessel carried 33 to 35 passengers and 40 tons of merchandise. Passengers and crew made it to shore in the Albert's boats. 140 Dictator: Schooner barge of 500 tons rolled to starboard in a storm and sank 11/21/1880 while being towed by the steamer Morely off Long Point, Ontario. The vessel carried a cargo of wheat at the time of the wreck. 140 J K Lockwood: Wooden schooner scow of 102 ft went ashore and broke apart in rough weather 9/1/1870 on Long Point, Ontario. The vessel carried a cargo of marble at the time of the wreck. 140 Mocking Bird: Wooden 3 masted schooner of 174 ft and 426 tons broke main mast gear and sprang a leak in a storm on 10/10/1876. The vessel sailed for shelter on the South shore of Long Point, Ontario and sank just off the beach, where it broke apart. The Mocking Bird carried a cargo of coal. 140 Orion: Wooden 2 masted schooner of 102 ft wrecked in a storm 8/31/1872 off Long point, Ontario. 140 Wocoken: Wooden steamer of 251 ft broke apart and sank on 10/14/1893 in a gale off Dunkirk, New York. Fourteen crewmen died in this wreck. The vessel carried a cargo of coal. 141 Belle Mitchell: Schooner of 136 ft sank on 10/14/1886 in a gale 22 miles off Long Point, Ontario. Eight crewmen died in the wreck. The Mitchel carried a cargo of wheat. 141 Wanderer: Wooden Schooner of 2 masts and 63 tons sank in a storm on 10/12or13/1874. Swayze says 20 miles out of Cleveland near Long Point, and J.W. Stone puts the wreck just off Long Point. The entire crew of five perished. The Wandered carried a cargo of coal. 142 Aycliffe Hall: Steel freighter of 253 ft sank on 6/11/1936 after colliding with the steamer Edward J Berwind 18 miles South and West of Long Point, Ontario. 142 St James: Wooden 2 masted schooner of 125 ft sank 10/? ?/1870 approximately 7 miles Southwest of Long Point, Ontario. The vessel carried a cargo of 14,000 bushels of wheat at the time it sank. The St James currently lies in 150 ft of water and is supposedly one of the best preserved wrecks in the lake. We have obtained a Loran C location of 16497.6, 58530.3 which we have not confirmed. The Niagara Divers Association's web site lists a position of 42deg 27.014', 80deg 07.331'. 142 Tradewind: Wooden 3 masted bark of 366 tons collided with the brig Sir Charles Napier while on opposite tacks in a blinding snow storm on 11/30/1854 off Long Point, Ontario. The Tradewind sank quickly. The entire crew survived by climbing into two large US government lifeboats which were being transported on deck as cargo. The Tradewind also carried railroad iron and stoves. The Niagara Divers Association's web site lists a position of 42deg 25.516', 80deg 12.056'. 143 Dinah: Vessel of 16 tons sank 7/4/1910 off Long Point, Ontario. 143 Jersey City: Steam freighter ran aground in a gale 11/24/1860 on the tip of Long Point, Ontario. Sixteen of the crew of twenty two died in the wreck. The vessel carried a cargo of flour and barrelled pork hides. 143 Kate Norton: Wooden schooner sank 11/4/1863 near Long Point, Ontario. The entire crew died in the wreck. 143 L Shickluna: Wooden propeller steamer of 135 ft sank due to a collision 4/28/1897 5 miles off Long Point, Ontario. 144 Alzora: 2 masted wooden schooner of 62 ft blown ashore and wrecked in a storm 10/?/1895 1/2 mile from the lighthouse on the South side of Long Point, Ontario. 144 Conductor: Schooner driven ashore on 11/24/1854 on Long Point, Ontario and broken apart in a gale. This wreck led to what is perhaps the most legendary rescue on the lakes. As the Conductor began to break up and sink in the surf 1/2 mile offshore, a poor woman living nearby named Abigail "Mother " Becker saw the nine man crew in distress and climbing the masts to avoid the icy water. She was a big woman and couldn't afford to buy the special large shoes she required and therefore went barefoot. Since her husband was away and the nearest neighbor lived 14 miles distant, Mother Becker started a fire on the beach to coax the survivors to swim to shore, but not one tried. At this she waded and swam out to the sinking vessel through the surf and dragged the crewmen, starting with the captain, one by one back to the beach. In all she made nine trips to the boat and saved the lives of the entire crew! The story of this deed was widely published in the papers of the time, and was recorded in a poem by Whittier. As a reward for her efforts the Becker family received money, shoes, and a 100 acre farm. For decades following this event steamers sounded their whistles as a tribute as they passed the Becker's house. 144 C W Elphicke: Wooden freight steamer of 273 ft broke in half and sank after being driven ashore on Long Point, Ontario on 10/21/1913 in a storm. 144 Henry Clay: Passenger and freight steamer capsized and sank in a gale on 10/25/1851 West of the tip of Long Point, Ontario. From sixteen to nineteen people lost their lives in this incident. The Clay's cargo of baled wool washed ashore for months afterwards. 144 H S Fairchild: Wooden schooner of 136 ft collided with the schooner Harvest Home off the tip of Long Point, Ontario on a dark night 10/6/1871 and sank rapidly. The Fairchild carried a cargo of wheat at the time. 144 James Scott: Wooden 2 mast schooner of 58 ft stranded and broke apart in a storm on 11/?/1882 at Long Point, Ontario. 144 Mary Morton: Wooden schooner of 246 tons ran aground in a storm on 11/19/1870 and broke in two amidships on Long Point, Ontario. 144 Merrimac: Wooden 3 mast schooner of 269 tons sank in a storm 5/1/1867 on Long Point, Ontario. Five of the six crewmen died in the wreck. 144 Montcalm: Wooden schooner of 138 ft driven ashore and wrecked in a violent Southwesterly gale 11/19/1891 on Long Point, Ontario. The Montcalm carried a cargo of iron ore at the time. 144 Oxford: Wooden 2 masted brig of 114 ft collided with the steamer Cataract while bound from Ogdensberg to Toledo on the night of 5/30/1856. The Oxford sank rapidly off Long Point, Ontario with the loss of the lives of five of the seven people on board. Upon the collision, the Captain rushed below to rescue his wife and child and went down with them. The vessel carried a cargo of iron ore at the time of the sinking. The Niagara Divers Association's web site lists a position of 42deg 28.855', 79deg 51.843'. 144 P C Sherman: Wooden 3 mast schooner of 406 tons sank in a storm 3/14/1888 off Long Point, Ontario. Seven members of the crew died in the wreck. The Sherman was later raised and removed. 144 Ralph Campbell: Wooden 2 masted schooner of 127 ft swamped by a storm and broken after drifting ashore 10/14/1909 near Long Point, Ontario. 144 Saxon: Wooden 2 mast brig or schooner of 131 ft stranded and pounded apart in a storm 11/10/1871 on the South side of Long Point, Ontario. The Saxon carried a cargo of building stone which was salvaged in 1876. 144 Swallow: Wooden steam propeller lumber freighter of 134 ft sank in a gale 10/18/1901 near Long Point, Ontario. The crew were picked up by the barge Manitou which the Swallow had been towing. The barge then drifted for 39 hours until rescued by the steamer Walter Scranton. The Swallow carried a cargo of lumber and shingles. 144 W J Suffel: Wooden 2 masted schooner of 120 ft ran aground and broke apart in a storm 11/26/1910 on Long Point, Ontario. 144 Young Phoenix: Schooner sank ?/?/1818 off the tip of Long Point, Ontario. 145 Chicago: 2 masted brig of 257 tons while running empty out of Buffalo 10/13/1851 capsized in a sudden squall off Long Point, Ontario. Three crewmen drowned, while the rest were rescued by the schooner Home. 145 Emily: Schooner capsized and sank in a gale 11/?/1842 near Long Point, Ontario. The vessels entire crew died in the wreck. The Emily was carrying a cargo of wheat. 145 Madiera: Schooner of 137ft stranded and broke apart on 10/3/1877 on the tip of Long Point, Ontario. 146 Ann: Schooner sank ?/?/1827 off Long Point, Ontario. 146 Brown Brothers: Tug of 75 ft sank 10/28/1959 5 miles off Long Point, Ontario. 146 Henry Wheaton: Wooden schooner of 200 tons driven ashore in a storm 10/28/1855 while attempting to enter Long Point Cut. The vessel was worked free but ran upon a reef and sank. The crew remained in the rigging for 17 hours until rescued from shore. 146 "the arches": Steamer with hogging arches. Scott McWilliams gives us a location of 42deg 27.468', 80deg 00.986'. We have not yet confirmed this position. According to Scott, "the arches" wreck is also known by some divers as the Ohio. Scott points out that this association is very unlikely since the Ohio was reported to have been blown apart by the explosion which sank it, while "the arches" is still relatively intact. Our research seems to confirm this since we recently received a copy of a lithograph from the Great Lakes Historical Society which shows the Ohio without hogging arches. This vessel lies in 160 feet of water. 146 Resolute: Wooden barge of 80 tons sank in a storm on 3/14/1887 off Long Point, Ontario. Two crewmen died in the wreck. 146 Sir C T Van Straubenzie: 3 masted schooner of 128 ft collided with the steamer City Of Erie on the night of 9/27/1909 and sank rapidly 8 miles off Long Point, Ontario. The vessel's entire crew of 4 perished in the wreck. 146 Smith: Propeller steamer of 120 ft sank in a storm 10/24/1930 4 miles off the end of Long Point, Ontario. Scott McWilliams gives us a location of 42deg 28.580', 79deg 59.030'. The Niagara Divers Association's web site lists a position of 42deg 28.486', 79deg 59.061'. We have not yet confirmed the position. The wreck lies in 160 feet of water. 146 Virginia: Wooden 2 masted brig of 160 tons sprang a leak and sank in a storm 11/3/1855 just off Long Point, Ontario. The vessel carried a cargo of lumber. 146 Wild Rover: Wooden schooner of 117 ft sank 11/4/1874 off Long Point, Ontario. The vessel carried a cargo of building stone which was partially salvaged two years later. 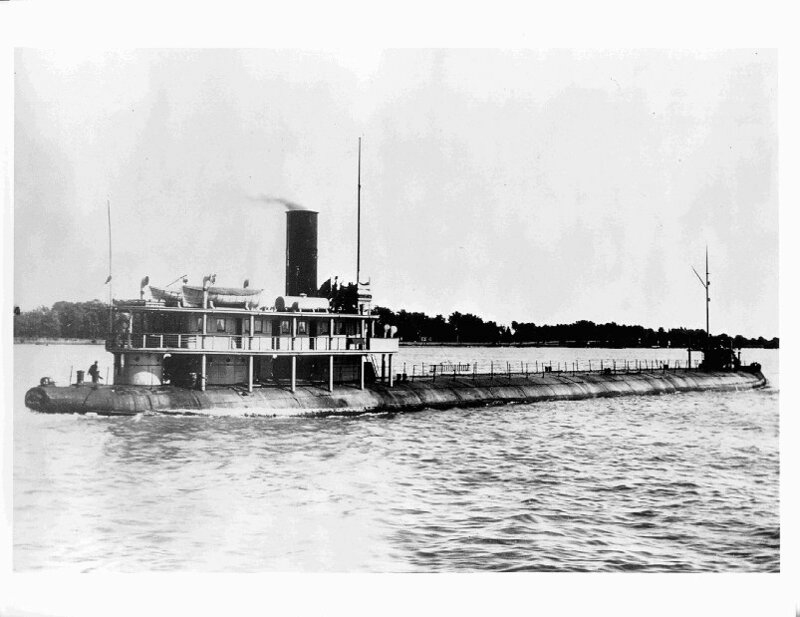 148 City Of Venice: Wooden freight steamer of 301 ft sank on 8/4/1902 after a collision with the steamer Seguin miles offshore and Southeast of Point Aux Pins, Ontario. Three crewmen died in the wreck. The Venice was transporting a load of iron ore.
148 Merida: Steel freight steamer of 360 ft sank on 10/20/1916 in a storm North of Fairport Harbor, Ohio in Canadian waters. The vessels entire crew of 24 died in this incident. The Merida was carrying a full load of iron ore at the time of the disaster. Wachter gives a DGPS location of 42deg 13.96', 81deg 20.79'. 149 H A Barr: Schooner barge of 217 ft broke loose from the steamer Theano and sank on 8/24/1902 in a storm near mid lake 30 miles South of Port Stanley, Ontario. Wachter gives a DGPS location of 42deg 09.11', 81deg 23.41'. 149 Marquette & Bessemer No2: Steel steam car ferry of 338 ft sank on 12/8/1909 position unknown. This is another of the long sought lost boats of the lakes. The M&B2 carried a cargo of 30 rail cars loaded with coal and steel. It left Conneaut, Ohio late in the morning with a crew of 33 and one passenger on a routine 60 mile run to Port Stanley, Ontario. As the day progressed the temperature dropped from 40 to 10 deg F and the wind rose to 70 knots from the Southwest in the worst blizzard to strike the lake in years! The following night at 1:30am several people on shore at Conneaut heard the vessels whistle sounding a distress call. Several people also reported hearing the M&B2's distress signal off Port Stanley at 3:00 and 5:00am, a six hour trip from Conneaut in good weather! The vessel was never seen again and likely went down in deep water while steaming for shelter on the lee side of Long Point. A life boat was found days later containing the frozen bodies of 10 crewmen. The bodies of other crewmen continued to drift ashore for months afterwards on Long Point, at Buffalo, and as far East as Niagara Falls. 150 James H Reed: Steel freight steamer of 440 ft sank rapidly on 4/27/1944 after being rammed broadside in a fog by the steamer Ashcroft in mid lake and nearly due north of Ashtabula, Ohio. Twelve of the Reed's crew of thirty five were trapped below and drowned. The vessel was carrying a cargo of iron ore and stone and was later dynamited as an obstruction to navigation. This may have been due to the Reed's size and location in the middle of the shipping channel since our charts show the wreck in 66 feet of water. Wachter gives a LORAN location of TD: 44278.0, 58139.6. 151 William H Stevens: Wooden freight steamer of 212 ft burned to the water line and sank on 9/8/1902 South of Clear Creek, Ontario and near mid lake. The Stevens was carrying a cargo of flaxseed (linseed) and 180 tons of copper ingots. The intensity of the fire is believed to have been due largely to the oil in the flaxseeds. It is reported that much of the copper cargo was subsequently salvaged. Wachter gives a LORAN location of TD: 44322.7, 58221.6. 176 Pascal P Pratt: Wooden freight steamer of 286 ft caught fire on 11/18/1908 and ran aground on Long Point, Ontario about a mile from the lighthouse. The Pratt was a total loss. 176 Siberia: Wooden freight steamer of 272 ft ran aground and broken apart on 10/20/1905 on Bluff Bar just off Long Point, Ontario. 176 William H Vanderbilt: Wooden 3 masted bark of 169 ft blown into shallow water during a storm and wrecked on 9/24/1883. The vessel later sank after drifting into deeper water on the East side of Long Point, Ontario. The crew was rescued from the rigging by the Long Point Lifesaving Service. Most of the cargo of iron ore was later salvaged. 182 Canobie: Wooden propeller steamer of 259 ft severely damaged in a storm 11/1/1921 30 miles West Southwest of Port Colborne, Ontario. The vessel eventually reached Erie, Pennsylvania and was scrapped. 194 Atlantic: Schooner collided with the steamer Buffalo and sank ?/?/1840 six miles East of Cleveland, Ohio. 195 Agnes E Marsilliot: Wooden 2 masted schooner of 88 ft capsized and sank in a sudden storm on 9/24/1860 7 mi off Port Stanley, Ontario. 195 Balti(c, n): Wooden 2 masted brig of 94 ft broke up on a reef during a storm ?/?/1855 near Port Stanley, Ontario. 195 City Of Sandusky: Side-wheel passenger and freight steamer of 177 ft sank on 3/24/1876 after burning at Port Stanley, Ontario. 195 Forest City: Wooden steamer destroyed by fire 4/5/185(6or8) at Port Stanley, Ontario. 195 Herald: Wooden propeller scow of 94 ft sank in a storm ?/?/1883 one mile off Port Stanley, Ontario. 195 Lydia Mack: Wooden schooner scow of 100 tons sprang a leak and sank on either 9/22/1877 or 10/3/1877 while 20 miles Southwest of Port Stanley, Ontario. The Mack carried a cargo of coal at the time. 195 O N Chapin: Wooden propeller steam tug of 47 tons stranded and wrecked in a storm 10/31/1856 at Port Stanley, Ontario. 195 P W D 117: Barge of 507 tons sank in the harbor at Port Stanley, Ontario on 5/29/1952. 195 Saginaw: Wooden schooner barge of 138 ft broke loose from the tow of the tug Alanson Sumner in a gale and went ashore on 8/27/1880 near Port Stanley, Ontario. A signal lantern was hung in the wreck to mark its position. The lantern later led to a fire which burned the vessel to a total loss. The Saginaw carried a cargo of lumber at the time. 196 Concord: 2 masted brig of 115 ft driven into shallow waters and sank in a storm 11/?/1869 5 miles West of Port Bruce, Ontario and 3 miles from shore. Five crewmen died and the remaining three survived in the frozen rigging for two days until rescued by the steamer Bruno. The vessel carried a cargo of coal at the time of the wreck. 196 Excelsior: Schooner wrecked on Claybanks Reef ?/?/1862 near Port Stanley, Ontario. 197 Burlington: Brig of 117 tons ran aground on a reef and wrecked ?/?/1852 near Port Bruce, Ontario. 197 Cadet: 2 masted schooner of 67 ft sank 8/16/1862 somewhere between Port Stanley and Port Burwell, Ontario shortly after leaving Erie, Pennsylvania for Toronto, Ontario. All six of the vessel's crew died in the wreck. The Cadet carried a cargo of coal and petroleum at the time. Parts of the vessel's cargo and wheelhouse were later found off Biffalo. 197 Constitution: Wooden schooner of 71 ft driven ashore in a Southwest gale and wrecked in huge waves ?/?/1859 near Port Bruce, Ontario. 197 Crevola: Wooden schooner driven ashore in a storm and wrecked ?/?/186(3 or 5) near Port Bruce, Ontario. 198 Bay City: Steamer wrecked on a reef ?/?/1862 near Port Burwell, Ontario. 198 Convoy: Wooden 2 mast schooner of 130 ft sank quickly in 12 fathoms on the night of 7/28/1822 after colliding with the bark Sam Ward 8 miles off Port Burwell, Ontario. The Convoy was carrying 18,000 bushels of wheat. In mid November the vessel was found 8 miles Southwest of Port Stanley, Ontario after other vessels collided with the wreckage. 198 D Foster: Wooden propeller tug of 48 ft burned after being rammed on 9/10/1887 at Port Burwell, Ontario. 198 D W McCall: 2 masted schooner scow of 94 ft sprang a leak while 20 to 25 miles out on 10/7/1877. The McCall ran for the safety of the harbor at Port Burwell, Ontario, but became unmanageable and struck a pier upon entering and supposedly ran aground and broke apart. The vessel carried a cargo of railroad ties at the time of the wreck. 198 E G Benedict: Schooner of 104 ft blown ashore by a storm on 11/19/1891 near Port Burwell, Ontario. 198 Everett: Schooner wrecked on a reef ?/?/1857 near Port Burwell, Ontario. 198 George Davis: Wooden 2 mast schooner ran ashore in a storm and broke apart on ?/?/1863 under the bluffs near Port Burwell, Ontario. 198 George M Able: Wooden 2 mast schooner of 146 ft ran onto a reef in a storm and broke apart on 8/29/1871 near Port Burwell, Ontario. 198 Gibson: Wooden schooner of 327 tons stranded and broke apart in a storm on 10/31/1875 near Port Burwell, Ontario. The crew was rescued by the Canadian Bark Lilly. The vessel carried a cargo of wheat at the time of the wreck. 198 Grace (Sherwood or Sherman): wooden schooner of 73 tons stranded and destroyed in a gale on 10/8/1875 1 mile east of the Port Burwell, Ontario docks. 198 H B Rathbun: Schooner of 149 tons driven ashore and wrecked in a storm 9/8/1878 while attempting to enter the harbor at Buffalo. The vessel carried a cargo of wheat. 198 J A Hope: Wooden schooner stranded on a reef in a storm and wrecked on ?/?/1858 off Port Burwell, Ontario. 198 Josephine: Wooden 2 mast brig of 175 tons driven on a reef and wrecked by a white squall on ?/?/1855 off Port Burwell, Ontario. 198 Marjon S: Propeller tug of 5 tons exploded and burned 4/29/1943 1 mile West Southwest of Port Burwell, Ontario. The entire crew of three died in the wreck. 198 Martha Freeme: Wooden 2 masted schooner of 89 ft ran onto a reef in a storm and sank ?/?/1848 near Port Burwell, Ontario. 198 Maxwell A: Wooden steam propeller tug of 80 ft burned ?/?/1915 at Port Burwell, Ontario. 198 Morning Star: Wooden 3 masted schooner barge of 181 ft sank in a storm while bound from Toledo to Buffalo on 11/4/1880 off Port Burwell, Ontario. All seven crewmen died in the sinking. The vessel lies in 75 feet of water. 198 Newburgh: Wooden propeller bulk freighter of 216 ft and 1299 gross tons ran aground near Port Burwell in a Southwest gale and blizzard on 11/19/1892. The vessel carried a cargo of flour and pig iron. The Newburgh's cargo and boiler were later salvaged. .
198 Northern Light: Wooden 3 mast bark of 135 ft wrecked on a reef in a storm ?/?/1862 off Port Burwell, Ontario. The hull may eventually have been recovered. 198 Robert Bruce: Wooden schooner of 135 ft blown on a reef in a storm and broke apart ?/?/1856 near Port Burwell, Ontario. 198 Saratoga: Wooden side wheel passenger and package freight steamer wrecked at the dock 7/29/1854 upon being pounded by a storm at Port Burwell, Ontario. 198 Suffolk: Schooner of 251 tons blown ashore in a storm 12/6/1854 near Port Burwell, Ontario and wrecked. The vessel carried a cargo of flour, barley, and pork at the time. 199 Forester: Schooner of 350 tons sank 9/18/1872 19 miles off Port Burwell, Ontario. 199 Frontenac: Schooner of 152 tons ran ashore in a gale and wrecked 9/30/1865 while attempting to enter the harbor at Port Burwell, Ontario. 199 Leviathan: Wooden 2 mast schooner scow driven ashore and broken apart in a gale on 10/29/1870 at the clay banks near Port Burwell, Ontario. 199 Louisiana: Wooden side wheel steamer of 777 tons stranded and broke apart in a gale on 10/20/1857 while attempting to enter the harbor at Port Burwell, Ontario. 200 Elliot: Schooner of 300 tons sank 9/18/1872 9 miles off Port Burwell, Ontario. 207 "17 fathom wreck": Schooner of 77.5 ft sank ?/?/? in Long Point Bay, Ontario. We have not yet associated this vessel with a name listed in our alphabetical index. Scott McWilliams gives us a location of 42deg 39.083', 80deg 03.142'. We have not yet confirmed this position. According to Scott, the wreck lies in 108 feet of water. 207 Sandusky: Wooden 3 mast bark of 148 ft lost in a gale 10/?/1845 East of Long Point, Ontario near Cattaraugus. 210 Atlas: Wooden propeller steamer of 375 tons stranded in a storm 10/26/1851 near the mouth of the Grand River at Fairport, Ohio. The vessel was reported to have been a total loss. 210 General Sherman: Wooden barge of 93 tons while being towed by the tug Edwards toward Ashtabula on 10/29/1874 took on water in a storm and anchored 2 miles off Fairport, Ohio. The crew rowed ashore in a small boat which capsized and the Captain's young son drowned. The General Sherman carried a cargo of lumber and salt. 211 Annett Davis: Small wooden schooner driven ashore and broken apart in a storm 10/21/1873 at Port Stanley, Ontario. The vessel carried a cargo of lumber at the time of the wreck and may have been salvaged. 211 Beatrice: Wooden steam tug of 79 ft burned 12/?/1885 at Port Stanley, Ontario. 211 B F Bruce: Wooden propeller vessel of 168 tons burned to a total loss possibly due to arson 8/?/1862 at Port Stanley, Ontario. 216 Baltic: Wooden schooner barge of 618 tons broke away from its tow vessel the tug Moore in a storm 9/29/1872 off Long Point, Ontario. The Baltic attempted to set sail but sank. The entire crew drowned while attempting to set out in a small boat. 216 Barge #3: Wooden barge of 306 ft abandoned by its tow vessel the Fischer along with Barge #4 in a storm 11/12/1900 off Long Point, Ontario. Barge #3 carried a cargo of pulpwood at the time. 216 Barge #4: Wooden barge of 306 ft abandoned by its tow vessel the Fischer along with Barge #3 in a storm 11/12/1900 off Long Point, Ontario. Barge #4 carried a cargo of pulpwood at the time. 216 British Lion: Wooden 3 masted bark of 128 ft driven ashore in a storm and wrecked 10/4/1877 at Long Point, Ontario. This vessel was built for the transatlantic trade to Liverpool England. 216 Glad Tidings: Wooden schooner of 183 tons sprang a leak and sank in a storm on 10/26/1870 at Long Point, Ontario. 216 Helliwell: Wooden 3 masted bark driven ashore in a storm 12/2/1855 on the end of Long Point, Ontario. The captain and two crew members of the schooner Lowland Lass died while attempting a rescue. The Helliwell carried lumber and other items at the time of the wreck. 216 Junius: Wooden schooner of 216 tons struck a bar and capsized while attempting to round the end of Long Point for shelter from a storm on 9/13/1866. The crew were rescued by the schooner Seabird. The Junius carried a cargo of black walnut lumber. 216 Kent: Wooden side-wheel steamer of 122 ft collided with the steamer London on 8/12/1845 and sank quickly in 12 fathoms 10 miles from the end of Long Point, Ontario. Ten of eighty seven passengers on board died in the wreck. The Kent carried a cargo of general merchandise. 217 James Buckley: Wooden propeller steam tug of 48 ft burned ?/?/? in the harbor at Port Stanley, Ontario. 219 Captain K: Steel fishing trawler rammed at night by the Canadian Coast Guard Cutter Griffon and sank 3/18/1991 off Port Dover, Ontario. Three crewmen died in the wreck. 219 David Sharp: Schooner of 91 ft took water and capsized in a gale 9/8/1878 20 miles West of Grand River, Ontario. The crew, and the captain's wife and child clung to the upturned hull for 11 hours until rescued by the schooner Dundee. The Sharp carried a cargo of railroad ties at the time of the wreck. 222 Argyle: Wooden side-wheel steamer of 94 ft wrecked in a storm 8/?/1877 near Port Rowan, Ontario. 222 F P Sears: Wooden canal boat of 100 ft broke loose in a storm on ?/?/???? while being towed toward Buffalo by the steamer Empire. The Sears was driven ashore near Port Rowan, Ontario and was broken to pieces in the surf. 225 Anzac: Tug of 9 tons caught fire and burned 5/6/1947 18 miles Southeast of Port Burwell, Ontario. 225 Young Hickory: Wooden side-wheel steam barge of 82 ft foundered in a gale on 10/31/1877 off the Claybanks near Port Burwell, Ontario. The crew was rescued by the schooner Porter. The vessel carried a cargo of wood at the time. 227 Amity: Wooden side-wheel steamer of 102 ft stranded and wrecked in a storm 10/?/186(4 or 7) North Northeast of the tip of Long Point, Ontario. 227 Dan Marble: Wooden schooner of 169 tons sank on 7/21/1875 in 25 fathoms, or as we say here on the lakes, 150 ft of water, 8 to 9 miles East of Long Point, Ontario. The crew escaped in the life boat and were picked up by the schooner Mont Blanc. The Dan Marble carried 300 tons of coal. stranded and wrecked in a storm 10/?/186(4 or 7) North Northeast of the tip of Long Point, Ontario. 231 City Of Oswego: Wooden propeller passenger steamer of 357 tons collided with the steamer America and sank 7/12/1852 off Willowick, Ohio. Fifteen persons lost their lives in the wreck. The vessel was less than a year old at the time it sank. 232 Clough: Wooden 3 masted scow bark of 217 tons was driven ashore by a gale on 9/15/1868 and broke apart 12 miles East of Cleveland. 233 Nimrod: Wooden 3 masted schooner of 172 ft and 559 tons collided with the even larger schooner Michigan in fog on the night of 11/9/1874 and sank East and 10 miles out from Port Stanley, Ontario. The crew clung to the rigging and later escaped in the lifeboat. They were all picked up by the schooner Grantham. The Nimrod carried a cargo of 35,000 bushels of wheat.